It’s happening again. You may have a napping infant nearby, a sensitive downstairs neighbor, or even a freak storm keeping you indoors. Want to work out but need quiet exercises? We’ve got you covered with these tip-toe toning moves. There’s bound to be one—or more—that will work for you and your environment. “Exercising at home is effective, comfortable, and economical,” says fitness expert and certified personal trainer, Joan Pagano, author of Strength Training Exercises for Women. Hey, she should know! She conducts the bulk of her training in her clients’ space-challenged Manhattan apartments. Experiment with some of Pagano’s favorite, low-key body-sculpting moves! Unless you’re really doing it wrong (put down that kettlebell), most yoga routines should be soundless, or close to it. Yoga is great at helping improve flexibility and core strength and can serve as a stand-alone or as an effective warmup or cool down for any quiet exercises at home. Handy stretchable resistance bands come in varying lengths and strengths, geared for any fitness level once the resistance increases, and the workload gets harder. For a quieter workout, swap your dumbbells for these soundless props. 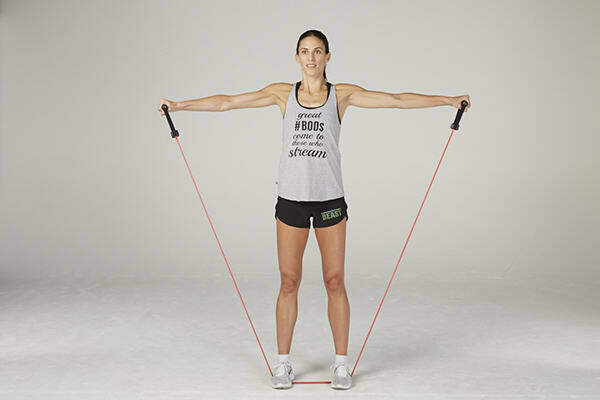 Try these quick and quiet resistance band exercises. Stand in the middle of the band and place each hand in a handle. Brace your core, and keep the band in place with your foot. Lift the band out to the sides to shoulder level, and hold for a beat before you return to start. Stand in the middle of the band and place each hand in a handle. Fighting against the band’s resistance, lift the band in front of your shoulders, hold up for a beat, then release band back to start, and repeat. Wrap the band around your thoracic spine (mid back) and gather up any excess band by wrapping it around your wrists and hands. It should be taut! Place hands on a step or elevated box (as shown) and come into full push-up position on your toes. Slowly bend both arms, lowering chest to the step or box briefly, then push back up to start and repeat. Make use of idle time by doing plie squats to work your thighs, calves, and core. And, dudes, don’t scoff. Professional football players have been performing full-on ballet training for decades to help strengthen calf and thigh muscles, and to improve their precision and timing. Plie squats: Stand with your feet wider than shoulder-width apart, toes pointed out, and hands on your hips. Keeping your back flat, torso erect, core braced, and knees aligned with your toes, push your hips down and back, lowering your body until thighs are parallel to the floor. Pause for a beat, and return to the starting position. Do 12-15 reps.
How many times do you stand in the kitchen, hanging around, drinking wine and waiting to baste your lemon garlic chicken thighs, or allowing that frittata to rise? Take advantage of your downtime to do counter push-ups, standing calf raises, and inner and outer thigh leg lifts. You’ll burn fat and build muscles with the yoga and Pilates-inspired quiet exercises in PiYo, and you won’t disturb your fussy downstairs neighbor by jumping or thumping around. If you’re looking for a low-impact, effective, quiet workout, give this program a try. “Stuck at home” doesn’t have to mean “stuck without a workout.” Access Beachbody on Demand and take your pick of home workouts you can tweak to turn into quiet exercises.